Earlier this week I came across this photo on pinterest and knew I had to recreate my own version of the look. There's something so warm and comforting about both camel and plaid so combining them is like a two for one special on fall trends. I've had this plaid shirt since.... college? maybe high school? A really long time. Last year I pulled it out from the depths of my closet and decided I should start wearing it again. It's surprisingly warm and as temperatures have been hovering pleasantly in the low sixties, it was perfect with an open cardigan thrown on top. I paired it with dark wash denim, a classic handbag, and black suede flats for a casual daytime look. Camel is such a pretty, warm neutral. I lean on it often in the fall. So pretty. Great post buddy. I really like the warm colors and simple shoes. FYI: Last week for a chance to win a pair of sunglasses for yourself and a friend. 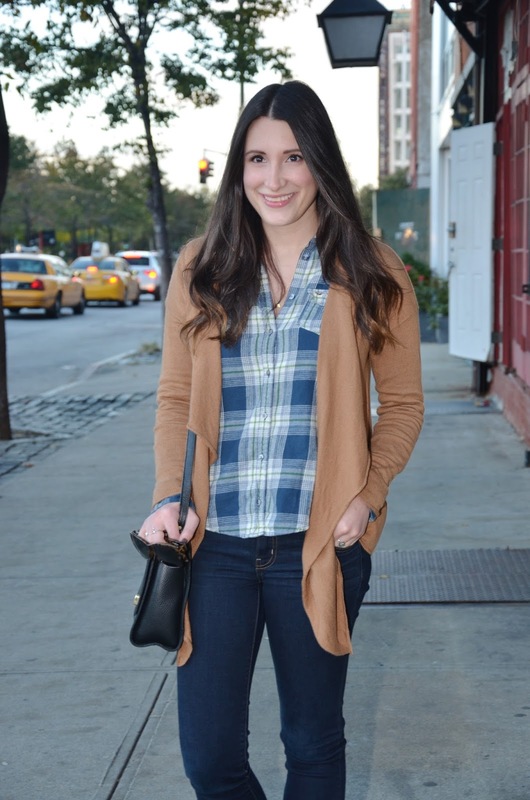 I really love that cardigan and well the color is pretty fantastic and a staple for Fall! I love a classic plaid button down. I just bought two for my daughter but I totally plan on borrowing them! I love them styled with a cardigan or a cute vest too! I seriously love that sweater! It's the perfect fall sweater! And that plaid shirt is awesome! this looks super comfy AND chic! love it. I've gotten so into plaid over the last few months...before I kind of associated it with a lumber jack (I have no idea why) but now I can't get enough of it! 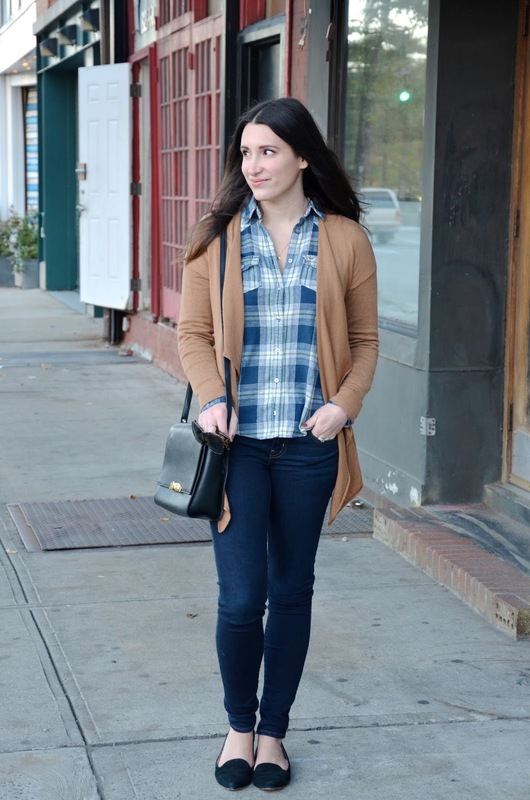 Love how you styled it with the camel cardi! I love finding pieces from high school that I can still wear-- that's a great plaid shirt!! :) I love the way you dressed it up a bit with dark jeans and the camel cardi. You look great! Cute outfit! I like the way you recreated the look! Adorable! Such a great casual fall look. Love the camel cardigan. I have a million cardigans, but I don't have a camel colored one. I may need to change that! 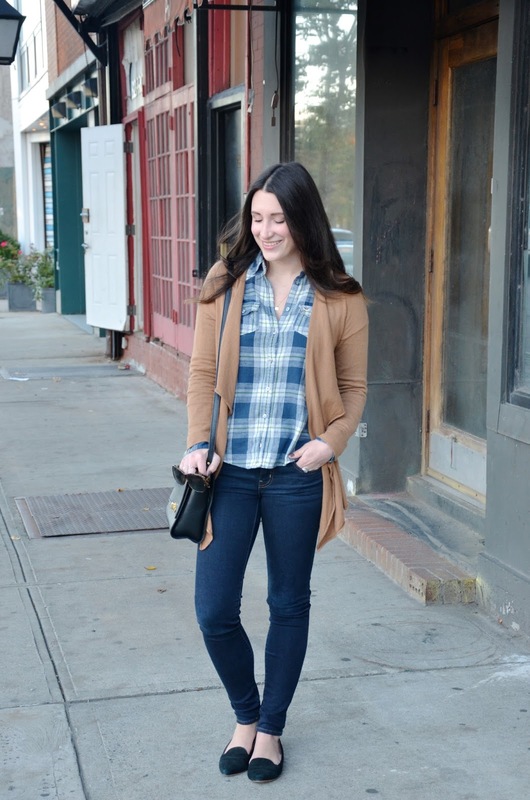 I love pairing plaid and camel, it's so cozy/fall-ish. Also, it seems like you've had a pretty warm fall in NYC, when I lived there before we had snow by Halloween! Thank you so much for taking the time to read and share your thoughts. I love hearing from you! Hi, I'm Lyndsay. I'm a newlywed living in New York City who gravitates towards casual basics and loves to picnic. Visit Lyndsay's profile on Pinterest.